We are in need of revamping and redesigning our current handheld menu. We currently have two versions of this menu and we took what we liked from both designs and merged it into one. Attached are the two current versions that we have now and a rough edit of what we want our new menu to look like. All the text and logos need to be cleaned up. I do not own or have copies of the logos used on the menu. I was hoping the files attached are big enough to be able to grab and reuse the logos. If not, please see if you can look it up online. We are open to using new photos as well for the 'Detail Services' on the menu. The current size of this menu is 10"x14". You are welcome to go under that if necessary, but please do not go bigger. 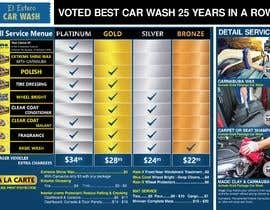 *Voted Best Car Wash 25 Years in a Row! *Follow all the PRICING on the RoughEdit attachment. This edit already reflects some of our price changes. *Please carefully review the layout and all changes made on the RoughEdit compared to the current menus. 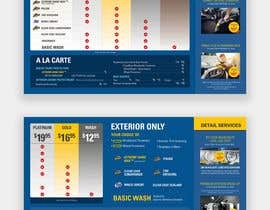 *Remove Tires & Trim from A-la-Carte items. *There should be no boxes around the text where it lists what is included in the services. Please edit/clean this out. *The prices do not have to be in a box/circle as well. You are welcome to make your changes in how this can looks. Message me any questions or if I may have forgotten any information regarding this project. what about the images on details services should we use that too or not or? You can use the same ones if you're able to photoshop the old text or prices out. 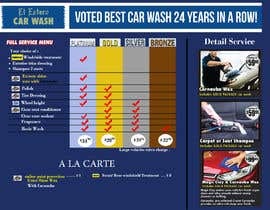 You are welcome to use new photos as long as it is showing the service correctly. I noticed some entries were using a Vacuum hose for the Shampoo service. We would need a Shampoo Extractor being used for this photo. Thank yoU! Do you need the new menu to be both sided as shown in version 1 and 2? Or does the entire menu need to be one side itself with an empty back with your logo and address? This is just for one menu. There is a front and back to it. Thanks! Unfortunately, I did not take the photos and do not have the logos. But I believe most of the logos can be accessed online. The photos, you are more than welcome to change as long as it is showing what the service is. Thank you! Please remove last period to view link. Sorry about that. Sorry about that. They didn't upload when I created the post. They are uploaded now. Thank you! Hello, i need of files, are not visible. Sorry about the files, I guess they did not upload when I created the contest. They are uploaded now.